In this Skill Builder workout on the NEW Dr. 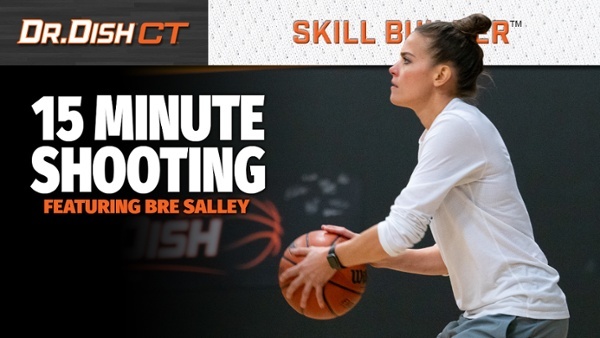 Dish CT shooting machine, our friend Bre Salley of the Minnesota Timberwolves and Lynx Basketball Academy demonstrates a 3 shooting drills that are set to 5 minutes each. This is a great workout to warm up and/or cool down and involves shooting off the move while maximizing reps in a short amount of time. In the first drill, Bre executes a simple "around the horn" shooting drill where she shoots from 9 different spots around the perimeter continuously until 5 minutes is up. This is pretty simple but helps the shooter get into a nice rhythm while moving around the arc. The Dr. Dish CT machine will then transition seamlessly into the next shooting drill without having to re-program anything. The 2nd shooting drill is called "Triangle Shooting" and focuses on 3 spot shooting. Here, Bre shoots a shot at each wing and finishes with a shot at the top of the key. This is repeated for 5 minutes. The last shooting drill is "spot shooting" and also another version of 3 spot shooting. This time it's a more simple "Wing-Top of the key-Wing" progression. Again, this goes for another 5 minutes to finish the workout. Throughout the entire 15 minutes, you can expect to get up 150+ shots from a variety of different locations while moving after each rep. It isn't necessarily a complete game speed workout, but focuses on maximizing reps and locking in your form from different locations. Make sure to challenge yourself and shoot within your range. The Dr. Dish will track shooting stats throughout each drill and the locations you shoot at. Those stats can be easily uploaded to the Dr. Dish Training Management where you can track progress. Always make sure to train hard, train smart, train with a purpose. Let's get it, baby!